This app was developed by researchers and clinicians after concern about the low uptake of vaccines among pregnant women. This app was developed by researchers and clinicians at Imperial College London and Imperial College Healthcare NHS Trust after concern about the low uptake of vaccines among pregnant women. Users are given guidance on fighting infections and how vaccines work, as well as information on UK vaccination programmes during pregnancy and immunisation in early childhood. 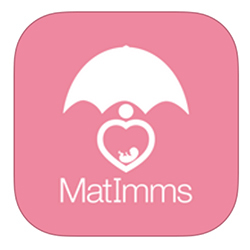 The app includes a personalised vaccination schedule with reminders about when to vaccinate a child during infancy. Usefully, it syncs to the users’ phone calendars and contains links to websites for further information. Midwives and children’s nurses can guide concerned parents to this app to reassure them about vaccinations and help them to make informed choices. Requires iOS 6.0 or later. Compatible with iPhone, iPad and iPod touch. Also available on Android.